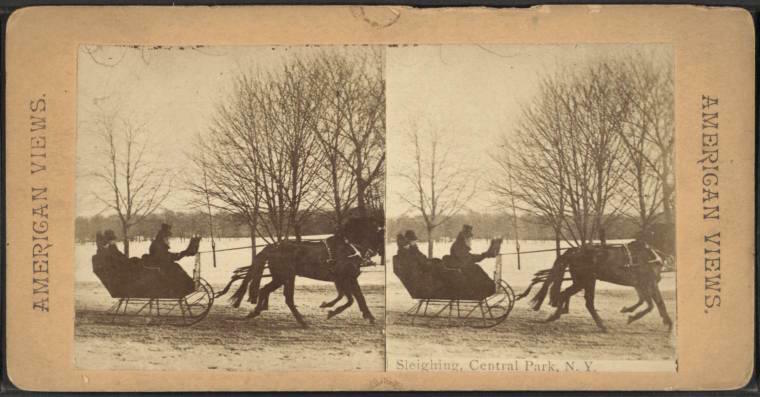 Imagine a city where every January, when winter is at its most brutal and bone-chilling, New Yorkers parked their stages and omnibuses and excitedly hitched their horses to sleighs (like these in Central Park in the 1860s). 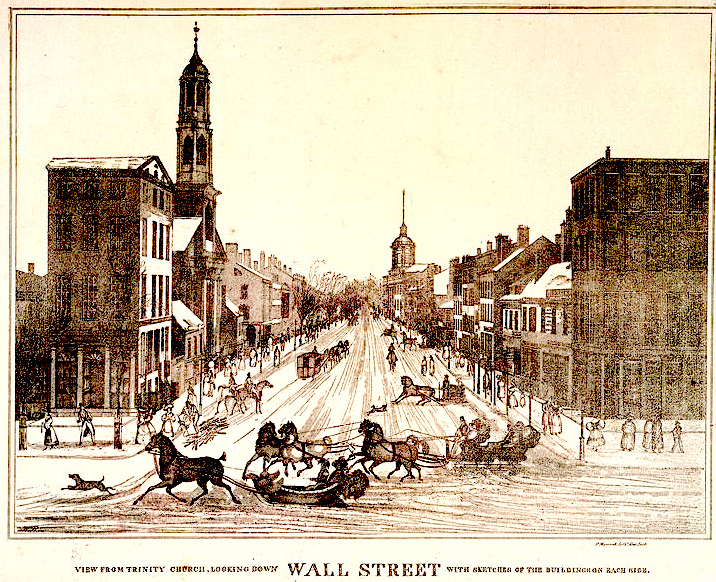 What was dubbed the “sleighing carnival” was an annual event in the 19th century metropolis (below, on Wall Street in 1834). 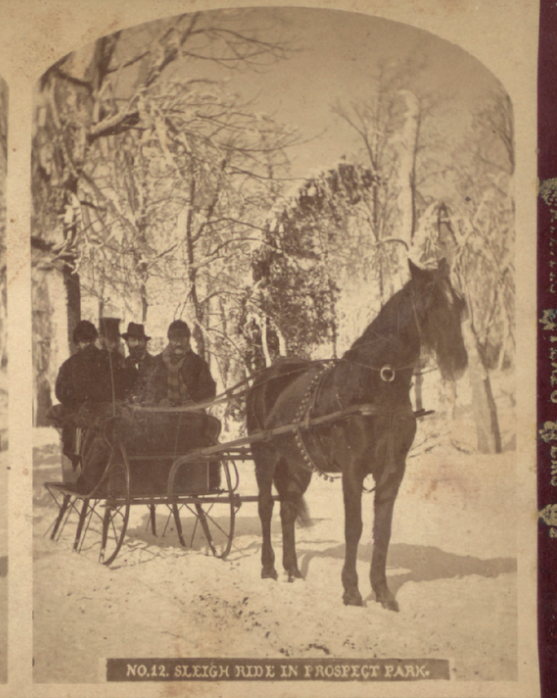 Once snow was on the ground and it was packed hard into the road, large sleighs were brought out for public transportation; “light” sleighs appeared too, kind of a personal carriage for joyriding, according to the Carriage Journal. 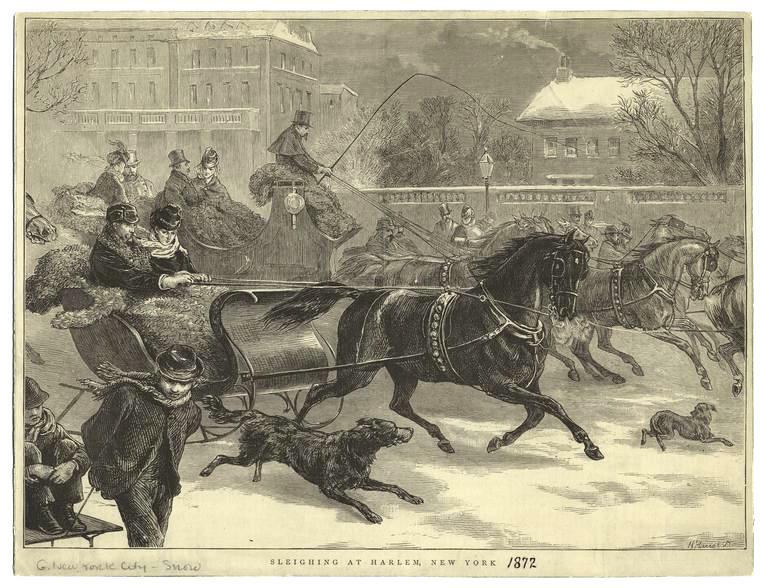 Joyriding meant going fast and thrilling passengers, as visitors to the city noted. 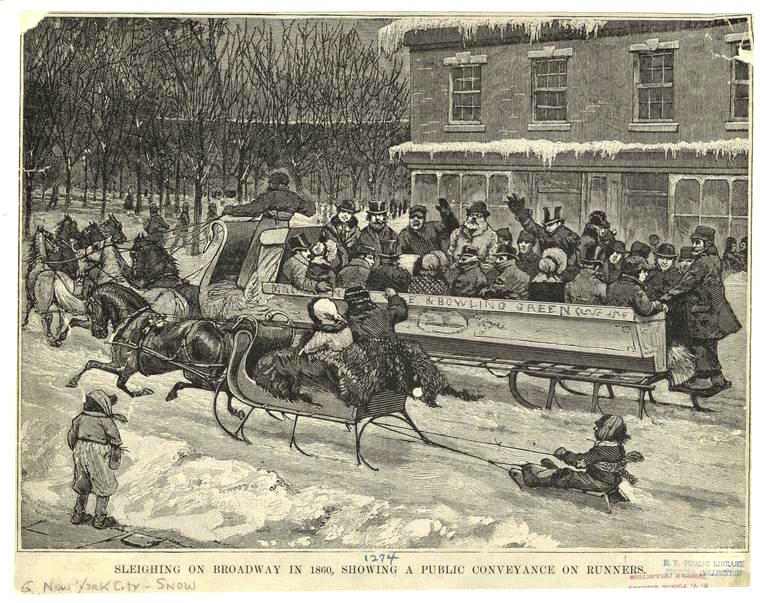 One of these visitors was Boston resident Sarah Kemble Knight, who wrote in her 1704 travel diary that New Yorkers’ winter fun involved “riding sleys about three or four miles out of town” in the Bowery. While out with friends, “I believe we mett 50 or 60 sleys that day—they fly with great swiftness and some are so furious that they’d turn out of the path for none except a loaden cart,” Knight wrote. 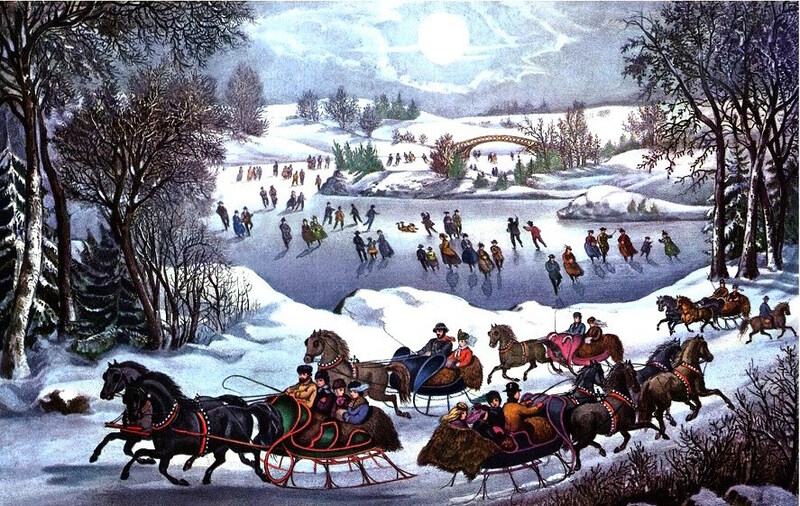 By the 19th century, the appearance of sleighs became a carnival, one of speed, fun, and thrills. 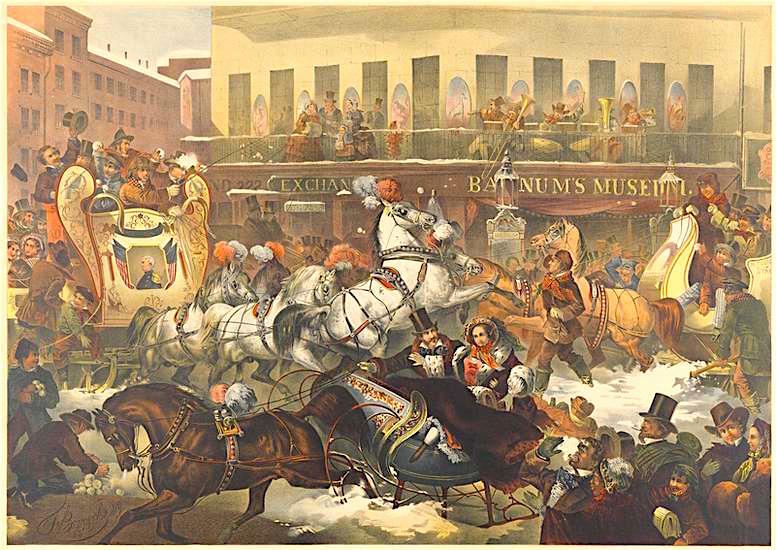 In 1830, after a heavy snow fell in early January and temperatures plunged, “the New York carnival began, and the beautiful light-looking sleighs made their appearance,” wrote James Stuart in his 1833 UK travel memoir, Three Years in North America. New York ladies apparently loved flying through the city on runners.